BRIDGEND follows Sara and her dad, Dave as they arrive to a small village in Bridgend County. The village is haunted by suicides amongst its young inhabitants, and Sara falls dangerously in love with one of the teenagers, Jamie while Dave as the town's new policeman tries to stop the mysterious chain of suicides. The film is an uncompromising story focused on the relationship between vulnerable teenagers and their parents who are left in the dark. The story of the film is based on a mysterious suicide cluster that took place in Bridgend County, a small former coal-mining province in Wales. Between December 2007 and january 2012 seventy-nine suicides were officially committed in the area. Most of the victims were teenagers, they hanged themselves and left no suicide notes. Danish documentary filmmaker Jeppe R�nde followed the teenagers from the area for six years and wrote the script based on their life stories. 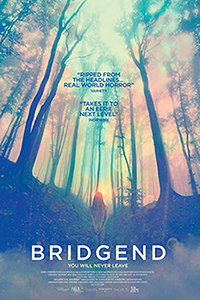 BRIDGEND is R�nde's fiction film debut. It is entirely shot on location in Wales, with many of the local teenagers casted as actors. I, Anna: The lives of a beautiful divorcee and a troubled detective intersect during the investigation of a vicious murder in London. Captivated: The Trials of Pamela Smart: A small-town murder in New England became one of the highest-profile cases of the twentieth century. Red Knot: A modern exploration of love, isolation and the inescapable vastness of the natural world. Starring Vincent Kartheiser and Olivia Thirlby.